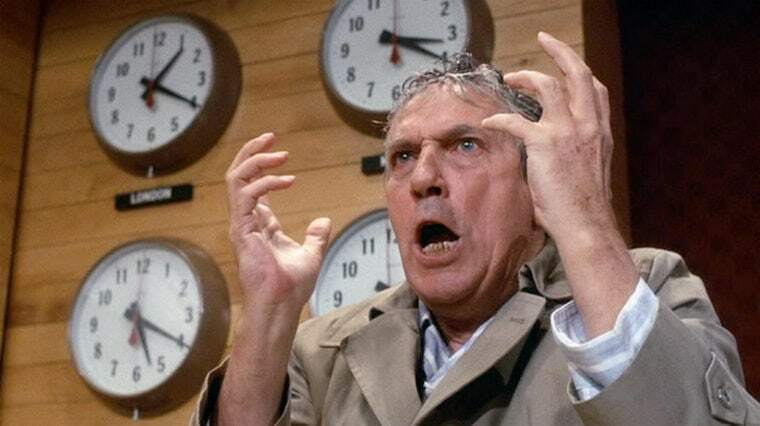 Peter Finch rants as Howard Beale. Click to see larger. Gottfried and Chayeksky are both best known for their biggest hit together: 1976’s Network, a scathing satire which explored the role of network TV news in society. The film centers on the struggling “UBS” network’s news anchor, Howard Beale (played by Peter Finch, pictured; the character’s first name was Chayefsky’s homage to Gottfried). After being told he’s being fired, Beale flips out on the air — and promises to commit suicide on live TV. The show’s ratings soar, and network execs cancel his firing and encourage “The Mad Prophet of the Airwaves” to keep ranting on his show. Beale’s angry rant, “I’m as mad as hell, and I’m not going to take this anymore!” catches on with viewers (both the fictional viewers of UBS, and by Network film-goers), but he’s still unstable, and his ratings drop …so the network execs have him assassinated on live TV. The film closes with a voiceover telling the audience that Beale was thus “the first known instance of a man who was killed because he had lousy ratings.” Ironically, Peter Finch died months later, and was the first actor to ever receive a posthumous Oscar for Best Actor; the film also won three other Academy Awards, including Chayefsky’s Best Original Screenplay. Chayefsky died from cancer in 1981, at 58. Gottfried suffered a stroke and died December 8, at 94. Author’s Note: Network is available on DVD from Amazon.